This book presents the first overview of Muslim architecture in Britain, from the earliest examples in the late 19th century, to mosques being built today. Key architectural stages are identified and explained alongside the social history of Muslim settlement and growth. The analysis focuses on the way in which the mosque as a new cultural and architectural form has benefitted into the existing urban fabric of Britain's towns and cities, and how this new building type has then impacted its urban landscape, socially, culturally and architecturally. The British Mosque is an architectural as well as a social history, and describes the evolution of Britain's Muslim communities through the buildings they have built. By presenting this architectural narrative for the first time, the book opens up a new field of British Islamic Architecture. The architectural story charts a course from the earliest mosques formed through the conversion of houses, to other large scale conversions through to purpose built mosques and with these the emergence of an Islamic architectural expression in Britain. 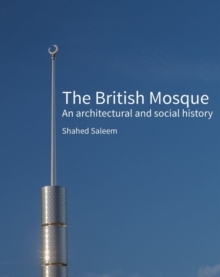 As the mosque is not solely considered in terms of its architectural style, but also from its social history and cultural meaning, this book provides an observation into the character of British Muslim life and practice and how these have been embodied through its buildings. The future of Islamic architecture in Britain is also considered, and how this will be affected by the growing cultural and social diversification of Britain's Muslim communities.